2016 was a horror of a year for me. I know many feel the exact same way. I had to learn to get along with myself. One would think after 31 years I would know myself, unfortunately no. I decided to share the hardest lessons I learned in 2016, the personal ones and the writing ones. If you meet me in person you’ll quickly pick up that I’m socially awkward. I wouldn’t be sure how to keep a conversation going and would end up talking about the most absurd things. Online, probably not. At least I don’t think. But, I’m learning to accept my social awkwardness. I know, I know. Don’t yell at me. I’ve followed every single piece of advice to the letter. I did everything I was told will have readers notice my book and, well, I didn’t do much aside for driving myself crazy. Literarily and figuratively. I don’t think anyone really has all the answers. There’s always a part that is up to fate and that’s okay. I used to worry about not getting book reviews so much, I would trigger a migraine. Maybe my first book is not that appealing, or maybe my blurb is crappy, or maybe readers don’t like my cover. Either way, I did the best I could, and now it’s time to move on to book 2. When I get stressed, I feel anxious. When I’m anxious, it triggers a depression episode. So, I have to keep writing and growing my own writing business and not stress about it. Easier said than done, but I have started using adult colouring books, and surprisingly, it helps me calm down. I don’t have to be a full-time writer right now, even though that is my goal for the future. I will get there. It’s okay that I can’t make a living off my writing yet. I will someday. I know I will get there. Some of us do things at a slower rate than others. That’s okay. Again, I’ve read articles and books that tell you you must have a blog and a Twitter, Facebook, Instagram and whatever else account. I did all that and most days I wish I sticked to only blogging. You can have all those accounts if you don’t mind, but even having just one of the above social media accounts is enough. If you don’t accomplish every goal you set yourself once off, doesn’t make you a failure. It teaches you patience. Trust me, it’s a hard lesson to learn. No matter how hard I tried, I just couldn’t write a sentence last year. At least not towards my second book. I made myself sick worrying that my first book was simply a fluke. As I learned to work with my anxiety, the more open minded I became. I’m by no means free of my anxiety or depression, but I know a little bit more about how to be calm and patient with myself. It’s okay to like doing other things, like reading, dancing, colouring and so forth. I didn’t always see it that way. I want to be a writer, so I have to write almost all hours of every day. Not true. If you’ve reached your writing goal for the day, go do something else that also brings you joy. Stupid, I know, but I always pushed myself to strive for perfection in every aspect of my life. I’ve never been good at that. Do you know how hard it is for an accident prone person to achieve perfection? It’s impossible, but so is perfection. I thought that if I wrote an error-free manuscript I would feel happy. I didn’t. Besides, I still found an error, which I added after my editor gave me my final manuscript back. It doesn’t matter whether it is life, a road trip, or taking on the hard task of writing a book. Every word, part of the journey, must be enjoyed. Don’t tell yourself that once you do . . . that you will take a moment to breath, or once you do . . . you will feel happy, it doesn’t work. I know, because I’ve been doing that all my life. Until recently, I didn’t know just how unhappy and harsh I was with myself. Being that unhappy is simply not worth it. If you’re looking toward others to define you, you’re doing something wrong. Nobody will know what is right for you, or the best for you better than yourself. I know that now. Sure I look toward my siblings to tell me if certain business decisions make sense, but only I know if I’m ready to give up on writing. Only I know whether doing a career change is really what I want. Only I know how a situation makes me feel. Others can speculate, but only you know. So trust yourself. I’ve learnt not to trust myself. I used to think that it’s all, or nothing. But life isn’t like that. You can do more than one thing. Humans are complex creatures. I know I am. I love writing, but I also love watching TV. If I complete my writing goal early in the day, I can spend the rest of my day doing the other activities I like. Trust your instincts. It’s kept you alive thus far. When I first heard that I was too hard on myself, that I was bordering on mentally harming myself, I couldn’t believe it. I thought that was normal. That I was encouraging myself. Nope. I was being disrespectful and abusive toward myself. Self-destructive even. Learning to care for myself was so strange. One of the first exercises I had to do in therapy was to tell myself three good things about myself everyday, for a week. I couldn’t do it. I still have a hard time with that to this day. I was never focused on my health. I was arrogant to think I would always have it. In 2016 my health went downhill drastically. I’m still fighting to get it back, but I learned to be grateful for even the crappy days, as it reminds me I’m still alive. Unlike many who lost their lives in 2016. I focused so much on being a good writer, that I burnt myself out, trying to please everyone. Another task which is impossible. So in conclusion, be kind to yourselves. At the end, you are the person you spend the most time with. Yep 2016 was a tough year, but I intend to make 2017 a much better year and actually start enjoying myself. The opposite of depression isn’t happiness, it’s living. I want to live this year. How about you? 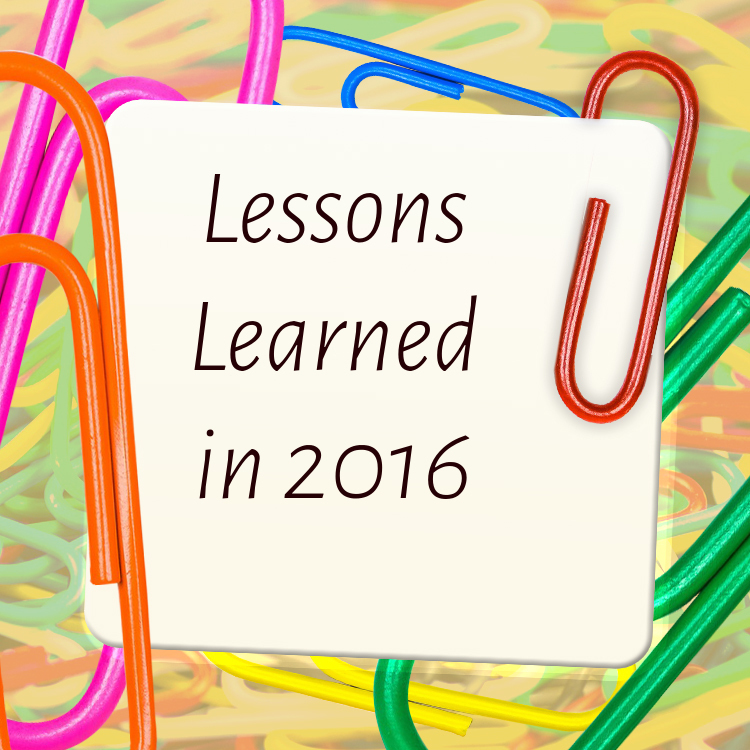 Did you learn any lessons in 2016? Those are some wise lessons. I've not written much of anything for about a year. Like you said, that's all right. Good health is something you have to work for. Keep fighting. Hope this year is much better for you. I won't admit to 'lessons learned', which imply I erred, and well, that just doesn't happen. We've got to be our own best friends. We would never beat up or talk to our best friends the way we do ourselves! Thanks, Madeline. Yeah, I can be very rude to myself, but I'm changing that . . . Hopefully. Thank you, Hilary. I'm trying to stay away from things and people that are negative. It's tough, but necessary. I'm sorry that 2016 was a difficult for year, and I hope that 2017 is full of writing and happiness for you. It's okay if you didn't write as much as you would have liked (neither did I); sometimes life just gets in the way. The point is that you're continuing to write now, and that's what matters. That you've learned these incredible life lessons at 31 is miraculous to me. I'm still learning them and I'm 67. Bravo, Murees. You are a wonderful young woman and I admire you so much. Thank you, Karen. I've been told that I'm like an old soul. But for my own sanity, it was important I learn these lessons, so I can move forward. We all work differently. Never should we follow every piece of advice we hear. I hear so many people complain about having to go on social media, but they don't have to if they don't want to. Or they can join one and see how it goes. That is SOME important list. I wish I could have said I learned those lessons when I was your age. You are far ahead of the game right now, in fact, winning. Just want to tell you that I have returned with a new blog, Belva Block. That is my real name and I am starting all over. A great list, Murees. One I can relate to. I have on many occasions wondered if I'm destined to sit in front of my keyboard and save myself the anguish of failing at social events. Then I discovered it's just me being hard on myself. I'm like so many others, yearning for human conversation. I've also learned that it doesn't matter what you do or don't do if you truly believe in yourself. Someone asked me how to do that the other day. Practise. Thank you, Joylene. It does take practice:) A lot. These are great lessons and I can relate to so much of what you wrote. I'm sorry you had such a difficult year, but you certainly came out stronger and wiser on the other side. I hope 2017 is treating you kindly so far and that, most importantly, that you are being kind to yourself. Take care! Thank you, Julie. I'm much kinder to myself these days than I use to be:) Wishing you well too. I am very proud of you Murees.Thank you for sharing the lessons you have learnt. It sure has been a benefit to me.